Prospect voters carried the $36.77 million budget for the Region 16 school system to success, despite the budget being rejected in Beacon Falls. Unofficial numbers showed the budget passed 783-659 after a day-long referendum today. Prospect taxpayers voted 410-205 in favor of the school budget. Beacon Falls residents weren’t as pleased with the budget and rejected it 454-373. “My social security check hasn’t gone up, so I don’t think anybody else’s budget should go up either…I’m not against education, but there’s too much fluff,” said Beacon Falls resident Walter Semrow. Region 16 Superintendent of Schools James Agostine was grateful to the voters for approving the budget. “I’m very thankful to the residents of the region for placing their trust in us for another year,” Agostine said. The $36.77 million budget is a $147,579 or 0.41 percent spending increase over the current school budget. However, due to a projected loss of about $486,000 in state revenues, Prospect and Beacon Falls taxpayers will need to come up with more than the spending increase to fund the budget. To make up for the loss in revenue, the budget means Beacon Falls and Prospect will have to pay a total of $520,621 in new money. The budget increases Beacon Falls’ net education cost $141,809 or 1.55 percent to $9.27 million. Prospect’s net education cost will increase $378,812 or 2.61 percent to $14.9 million. The remainder of the school budget is funded with state and federal monies. “We will use the money wisely,” Agostine said. Prospect unanimously passed a $6.9 million municipal budget for the 2011-2012 fiscal year at a town meeting in April. The town budget is $3,438 less than the current budget, and will not impact the mill rate. As of this post, it was unclear what the school budget would mean to Prospect’s mill rate. Prospect Mayor Bob Chatfield was expected the set the mill rate following the school budget’s approval. Although the school budget is set, the Beacon Falls town budget remains in limbo. 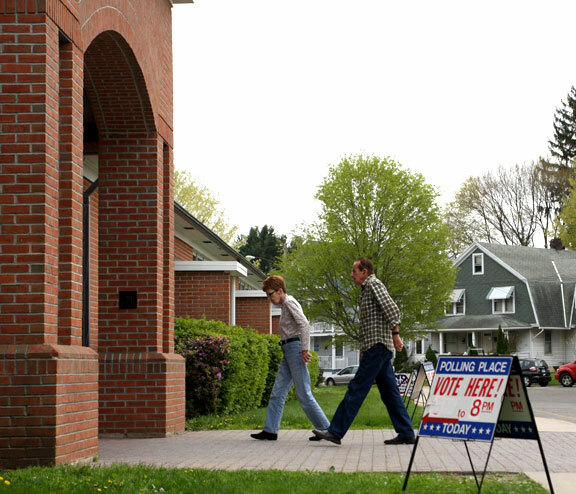 Along with the school budget, Beacon Falls voters were also casting their ballot for the town’s proposed $5.9 million town budget, an increase of $184,326, or 3.2 percent, today. The Beacon Falls town budget was rejected 437-386, and there was a belief after the ballots were tallied that displeasure with the town budget played a role in how Beacon Falls voters sided on the school budget. If both budgets had passed in Beacon Falls, the mill rate for the town was expected to increase by 0.6 mills to 26.20 mills. The Beacon Falls finance board is expected to meet May 10 to discuss how to proceed on the budget. Laraine Weschler contributed to this article.